The normal-sized ancient humans who first appeared on the island of Flores in Indonesia shrank rapidly and became small ‘Hobbits’, according to a recent discovery of a 700,000-year-old primitive human. Several fossils – of at least one adult and two juveniles – suggest that the original normal-sized humans who first set foot on the island became smaller and smaller over a surprisingly short period. A team of scientists from Japan, Australia and Indonesia published details of their study and findings in the prestigious journal Nature (citation below). The researchers, from Griffith University and the University of Wollongong, both in Australia, the National Museum of Nature and Science in Tokyo, and the Geology Museum Bandung in Indonesia, wrote about their discovery of ancestors of Homo floresiensis – the island of Flores’ mysterious species of pygmy-like humans. A partial skeleton of a primitive adult human female was unearthed from Liang Bua, a limestone cave in the west of Flores. 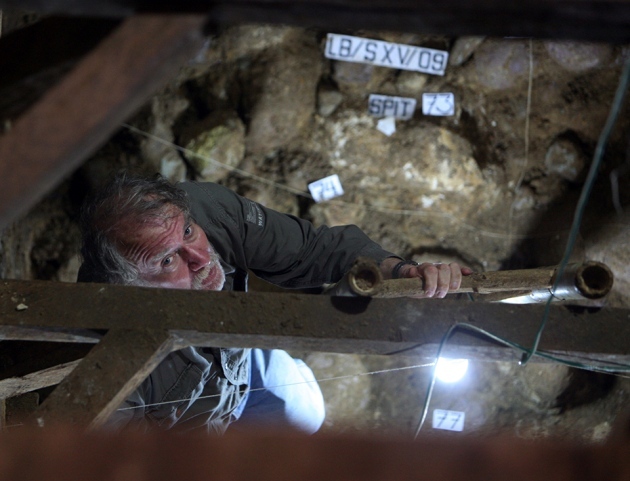 The skeleton – called LB1 – is the most extreme human ever excavated. It was incredibly short, just about one metre tall (slightly more than 3 feet), with a brain smaller than that of a chimp. This extremely small individual existed about 70,000 years ago. Now the authors explain that fossil remains of hominins of a similar size, excavated at Mata Menge, 70 km east of Liang Bua, are at least 700,000 years old. 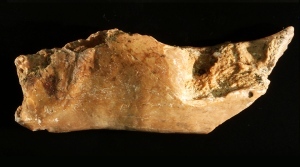 Archaeologists unearthed a fragment of a hominin lower jaw and a number of isolated teeth in a layer of sandstone which had been deposited next to a lakeside stream about 700,000 years ago. Co-author, Dr. Adam Brumm, an archaeologist and senior research fellow within the Environmental Futures Research Institute at Griffith University, says this new finding is the most spectacular breakthrough yet to help scientists understand the origin of ‘hobbits’. Ever since the hobbit bones were first discovered, researchers have been at a loss to make sense of where Homo floresiensis – a previously unknown species – fits into the human family tree. Scientists believe that these creatures evolved from an archaic branch of hominins who lived a long time before our own species in Africa emerged about 200,000 years ago. However, there is disagreement among experts regarding which member of the hominin group spawned Flores hobbits. 1. Java Man: some experts suggest that hobbits descended from Java Man, also known as Asian Homo erectus, an early hominin that reached the island of Java west of Flores approximately 1,500,000 years ago – Homo erectus was similar in height to modern humans. Perhaps a small group of these hominins became stranded on Flores, and reduced in size over time. This would be the first case we know of – of hominins conforming to the ‘Island Rule’ – in which mammals cut off on islands with no predators and limited food became small if they were large (dwarfism) or large is they were small (gigantism). 2. A very ancient precursor: other experts suggest that perhaps Homo floresiensis stems from considerably more ancient precursos, such as Homo habilis, or even an ape-like australopithecine, primitive forerunners of hominins known only from the early fossil record of Africa. The two hypotheses were put forward, and did not really make much progress for a long time, that is, until the discovery of these latest fossils. Dr. Brumm adds, however, that the mystery of the hobbit’s origins has not yet been conclusively resolved – we need more complete hominin fossils. The authors believe more skeletal remains will be found, given that the fossils unearthed so far at Mata Menge were of multiple individuals. The researchers are currently looking for a financial backer so that they may expand the scale of excavations at this site and other promising fossil locations on the island. The Mata Menge research was supported by an ARC (Australian Research Council) Discovery grant, and the Geological Survey Institute of Bandung. Citation: “Homo floresiensis-like fossils from the early Middle Pleistocene of Flores,” Gerrit D. van den Bergh, Yousuke Kaifu, Iwan Kurniawan, Reiko T. Kono, Adam Brumm, Erick Setiyabudi, Fachroel Aziz & Michael J. Morwood. Nature 534, 245–248. DOI: 10.1038/nature17999. In a spectacular new discovery, scientists have unearthed the fossilised remains of ancient hominins in Indonesia, which appear to be the ancestors of the tiny species of human – Homo floresiensis – affectionately nicknamed the ‘Hobbit’, that stood just over 3 feet (1 metre) tall.